The Peggy McCconnell Arts Center is hosting a free artist talk with a ceramic artist Alan Spencer on Wednesday February 19th from 7-8pm. For more information on the artist and his work visit http://www.mcconnellarts.org/wp/archives/13648. The Franklin County Neighborhood Arts grant provides funding for community-based arts projects. Civic associations, social service agencies, amateur arts organizations and others are eligible to apply. The next application deadline is February 28, 2014; to be considered projects must start after May 15, 2014. Prospective applicants are encouraged to attend a grant workshop from 4:00-5:00 p.m. on Thursday, January 30, 2014 in the third floor boardroom of the Columbus Main Library. RSVP to oregan@oaae.net. For the Franklin County Neighborhood Arts grant application and full program guidelines, visit us at http://www.oaae.net. Call for Entries is extended to visual artists and poets who are intrigued and challenged by artistically interpreting their experiences in thin places. Poetic, aural art will be featured with the visual art of the exhibit and opening reception on March 8. Please read more about the concept of thin places in the guidelines at http://www.Sanctuary-for-The-Arts.com. Located on Main Street in Alexandria, Ohio, Sunbear is the working studio for Meredith Martin, pastel artist, and also a gallery dedicated to showing the original work of local and Ohio artists. Meredith is currently looking of works in all mediums; photography, painting, jewelry, fiber arts, glasswork, pottery, wood, 2-D, 3-D.
Be sure to visit http://www.sunbearstudio.com, for information on gallery hours, upcoming special events, classes offered and much more! All artists and printmakers living within the Columbus OH and regional area are encouraged to apply to our new artist in residence program. Printmaking knowledge is a plus but not required. This is not a paid position. The terms of the residence allow for access to all the printmaking equipment and facilities housed at the Ohio State Universities Printmaking Department including Screen printing, Relief, Intaglio and Lithography… Ink and paper and other disposable materials are the responsibilities of the artist. While in residence artists are required to be present in the printmaking shop one day per week to be worked out between the artist and the Student Printmaking Association. A minimum of 6 hours of shop presence is required which could be spread over one or several days. Any other hours spent in the shop are left up to the artist. During this time the artist is expected to interact and engage the student population in the print shop possibilities to accomplish this are through demonstrations, an artist talk, studio visits critiques and printing assistance etc. To apply for this opportunity please send 10-15 images of work in jpeg format, no image should exceed 2mb in size; proposal for how you would make use of the printmaking facilities; Artist Statement and current CV to Marty Azevedo, Azevedo.7@osu.edu, with “PRINTMAKING ARTIST IN RESIDENCE” in the subject line. The one-month residencies will run starting November 2013 and will continue through May 2014 with the possibility of a longer residency through summer 2014.
is accepting submissions for their juried competition for digital art and photography! Entrants please submit three JPEG files of original work. All styles of artwork and photography where digital processes of any kind were integral to the creation of the images are acceptable. The selected winner receives 10 prints up to 44×60 inches on canvas or museum quality paper (approximately a $2,500-$3,000 value) to be shown in a solo exhibition in our main gallery from March 13-April 6, 2014. This is the 10 year anniversary exhibit for LACDA and will be widely promoted and will include a reception for the artist. Second place prizes: Ten second place winners will receive one print of their work up to 24×36 inches ($150-$200 in value) to be included in the anniversary exhibits opening on March 13! for inclusion in future shows at LACDA. Many entrants from past competitions have already been included in their exhibits. the theme being Femme Noir. curated by legendary LA artist George Herms. Our bodies are implicated in everything we do, think and say. The body is pivotal to our understanding of our place in the universe. 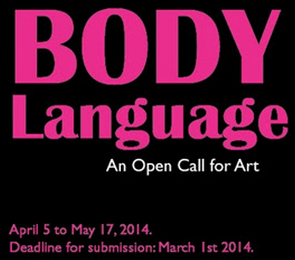 In contemporary culture, the body has become an extraordinarily complex signifier. The artists in body language ascertain the true dimensions of the inner-human sphere, connecting art to daily life, dreams, desires, and the return of the real. 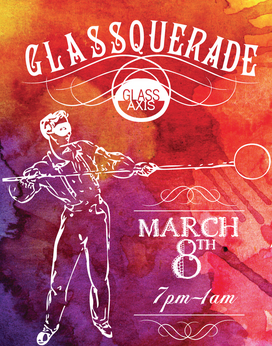 Join Glass Axis on March 8th for a Mardi Gras themed celebration fundraiser! The day will start with glass workshops for all ages. At 8 pm the formal fundraiser will begin featuring exciting glassblowing demonstrations and performances, live music and dancing. Ticket prices include appetizers and refreshments and a cash bar will be open all night. The highlight of the evening will be a high energy glass fashion show. Proceeds from the event will be used towards the upcoming move to their new facility in the Franklinton neighborhood. Enjoy an evening of entertainment by your local glass artists while supporting Glass Axis! Tickets will be available for pre-purchase on Eventbrite or at the door. General admission is $20, VIP admission is $50 & will include an impressive swag bag. Calling all Ohio artists and crafters, have you heard about Ohio Made? Ohio Made is a marketplace with vendor booths, a juried exhibition, demos, installations, live music, food, and great company! September 27, 2014 10am-5pm at the Ohio HIstorical Society, Ohio Village. A chance to sell your hand made work, a chance to participate in an exhibition with artist all over Ohio. This festival recognizes all artistic and creative minds! So check us out and book a booth! Wondering what Early bird registration gets you? Early birds will receive better promotions for the event as we will have their imagery and name to list as vendors. Spaces are 10×10 ft, you may purchase up to 3 spaces, all must be paid separately. Check out ‘Vendor Booths’ above for details! This juried exhibition will take place in the Ohio Village. The pharmacy, funeral parlor and school house, bank and female seminary will be the buildings in which selected juried works will be displayed. 3 awards will be given for ‘Best in Show’ by jurors and be presented at an Awards Reception: Celebrating Artists Now on Friday September 26, 2014. The winners of ‘Best in Show’ will be presented with two recognized elder artists in the community. So check out the above ‘OAL Member registration’ and ‘Non Member registration’ for more details! Interested in doing a demonstration during the festival? We can accommodate that! There will be a price reduction for approved applications. You will receive notice for approved applications. Are you an installation artist? Well we haven’t forgotten you! The Ohio Cancer Research Associates has put out a call for art for their 25th annual Capital Valentice Silent Auction. All proceeds go towards researching new cures for cancer. To learn more information or donate a piece contact Molly McNitt at mollyrodin16@gmail.com or 614.477.9234. The Ohio State University and Gateway Film Center are pleased to announce the first annual Buckeye Film Festival. To participate in the film festival, entrants should submit an original short film about why they love Ohio State. The winner will receive $1,000 cash, an annual pass to the film center, and two season tickets to the 2014 OSU Men’s football home games. Complete submission guidelines and additional information can be found at http://www.buckeyefilmfestival.com. 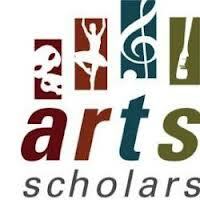 The Franklin County Neighborhood Arts grant provides funding for community-based arts projects. Civic associations, social service agencies, amateur arts organizations and others are eligible to apply. The next application deadline is February 28, 2014; to be considered projects must start after May 15, 2014. Prospective applicants are encouraged to attend a grant workshop from 4:00-5:00 p.m. on Thursday, January 30, 2014 in the third floor boardroom of the Columbus Main Library. RSVP to oregan@oaae.net. For the Franklin County Neighborhood Arts grant application and full program guidelines, visit us at http://www.oaae.net. “Artists in the Community” is GCAC’s grants and services program designed to support individual artists in Franklin County. Fellowships, supply grants and much more. Join Deanna Poelsma, Grants & Services Clerk in this informative session where she will de-mystify GCAC’s application process and provide some one-on-one consultation in an informal environment. Please RSVP to dpoelsma@gcac.org to attend this event. Walk-ins welcome, space allowing. Worthington for a special free artist lecture and talk featuring Alan Spencer! A contemporary, multidisciplinary facility presenting and promoting the performing, visual and digital arts. and cultural opportunities through both ticketed and free events. MAC continues the legacy of the Worthington Arts Council to advocate, create, and nurture arts programming.